☕️ Good Tuesday morning. 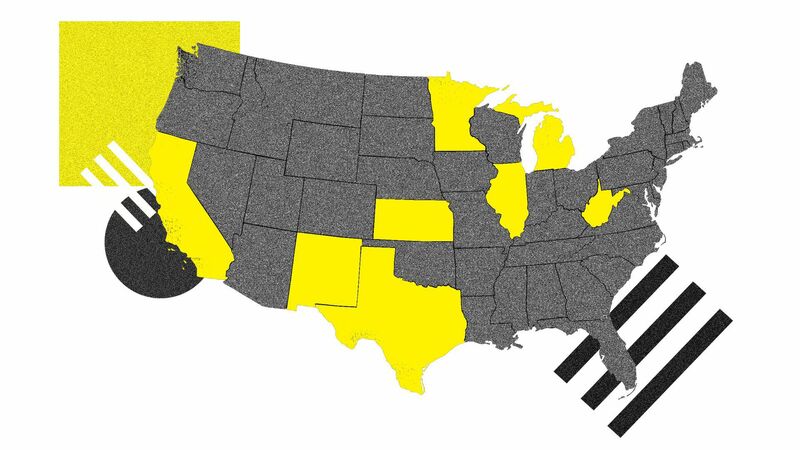 50 days until the 2020 campaign begins (the day after midterms!). Situational awareness: "China said … it has no choice but to retaliate against new U.S. trade tariffs, raising the risk that President Trump could soon impose duties on virtually all of the Chinese goods that America buys," Reuters reports. Supreme Court nominee Judge Brett Kavanaugh was asked privately yesterday about what past girlfriends would say about his conduct, as frenzied Republican officials prepared him for an epic hearing on Monday when he will rebut charges of a drunken sexual assault during high school. A source tells me the question about girlfriends was designed to help Kavanaugh's advocates show there was no pattern of conduct similar to the charge by Christine Blasey Ford, a biostatistician and research psychologist in the Bay Area who also is expected to testify Monday. A Republican source close to the process tells Jonathan Swan: "It blew up [on Sunday]. ... Now we've gone back toward reason and looking at facts. 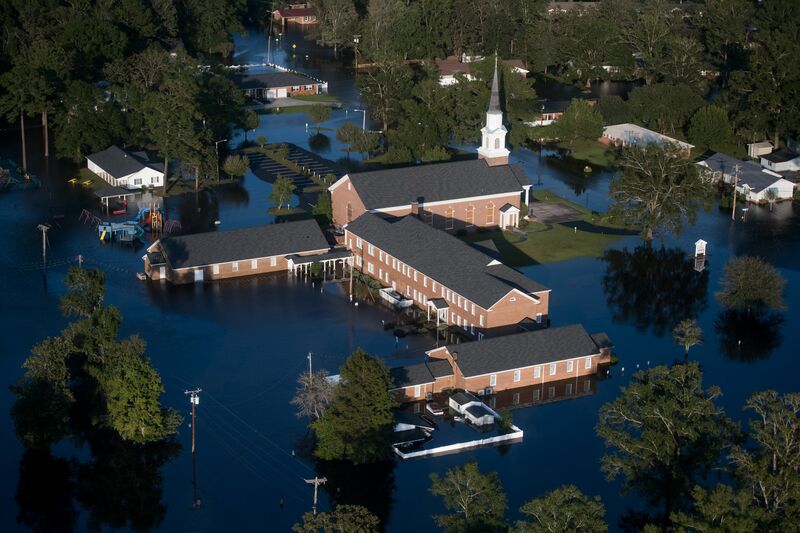 Psychologically, we feel a lot better about where we are." The momentous announcement from Senate Judiciary Committee Chairman Chuck Grassley (R-Iowa): "[T]he Committee will hold a public hearing with Supreme Court nominee Judge Brett Kavanaugh and Dr. Christine Blasey Ford," at 10 a.m. Monday in the Hart Senate Office Building. A senior Republican official close to the process, who admitted aides are worried about the hearing, tells Swan: "This gives the judge the opportunity to clear his name. But there is no room for error from members on the committee." 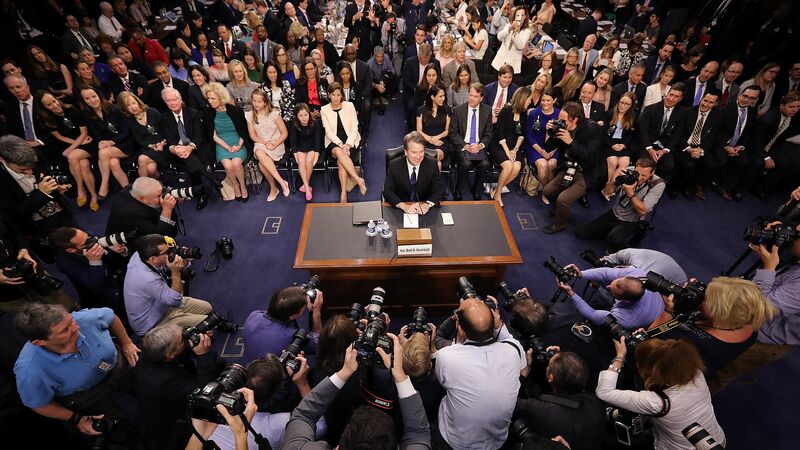 "Judge Kavanaugh could nail it and she could be terrible. But here's my fear: This all depends so much on the performances of two people." "And that's a lot to have outside your control, and that's not even accounting for the members themselves doing something stupid." "It's the circus of it. It's designed for TV, it's not designed for answers. You're just adding a huge element of the unexpected and the unpredictable." Kavanaugh spent nine hours behind closed doors at the White House yesterday, according to CNN, calling senators and huddling with White House Counsel Don McGahn. White House counselor Kellyanne Conway set the tone for the day by saying on "Fox & Friends": "This woman should not be insulted and she should not be ignored." "I actually think on this one he understands it's up to Brett to defend himself. I don't think the President's going to take responsibility for that. The President wants him to run his own show; and I think that's because if this was the President, he'd want to run his own show." Swan's whip count: Folks involved in the process seem to be most worried about Sen. Jeff Flake (R-Ariz.) — even more so than Sens. Susan Collins (R-Maine) and Lisa Murkowski (R-Alaska), whom they're quite worried about. In a reassuring comment for the White House, Sen. Lindsey Graham (R-S.C.), a Judiciary Committee member, told Fox News' Sean Hannity that he "will look at everything in Judge Kavanaugh's life, not just this accusation. And I feel good about it." Be smart: Because Ford told the Washington Post there are many details she doesn't remember, Republican officials don't expect new facts corroborating her account to emerge. Instead, they expect new scrutiny of her. The great unknown will be the emotion in the room — and the consequences if her testimony is credible. NBC's Andrea Mitchell tweeted last night that male senators' clueless questioning of Anita Hill during the 1991 confirmation of Justice Clarence Thomas was the "most searing experience I ever had as a congressional correspondent." "The parallels are eerie. 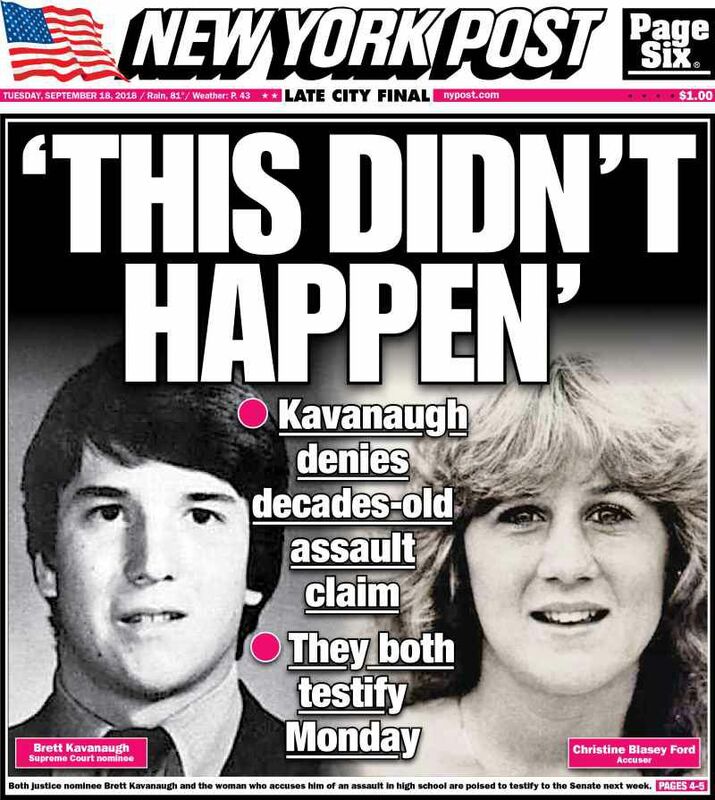 A female college professor, reluctant to publicly accuse a powerful man nominated for the Supreme Court of past sexual misconduct. Days before a vote, forced out of the shadows." "[T]his time the battle takes place in a different era, at a moment when the #MeToo movement has brought down many powerful men over accusations of sexual misconduct that were once swept under the rug." 3. 🌊 Introducing "The Axios 8"
Eight races will help determine if the "blue wave" will be strong enough to live up to the hype, Axios' Alexi McCammond writes. Texas Senate: Sen. Ted Cruz v. Democrat Beto O'Rourke. Ohio governor: Democrat Richard Cordray and Republican Mike DeWine are fighting to replace Gov. John Kasich. West Virginia's 3rd district: Democrat Richard Ojeda v. Republican Carol Miller in an open-seat race. California's 45th district: Republican Rep. Mimi Walters v. Democrat Katie Porter. Minnesota's 8th district: Democrat Joe Radinovich v. Republican Pete Stauber to replace Democratic Rep. Rick Nolan. Texas' 23rd district: Republican Rep. Will Hurd, a former CIA agent, v. Democrat Gina Ortiz Jones — a Filipina-American, a member of the LGBTQ community and an Iraq war veteran. Florida's 26th district: Republican Rep. Carlos Curbelo v. Democrat Debbie Mucarsel-Powell, a Latina immigrant. Iowa's 3rd district: Republican Rep. David Young v. Democrat Cindy Axne. 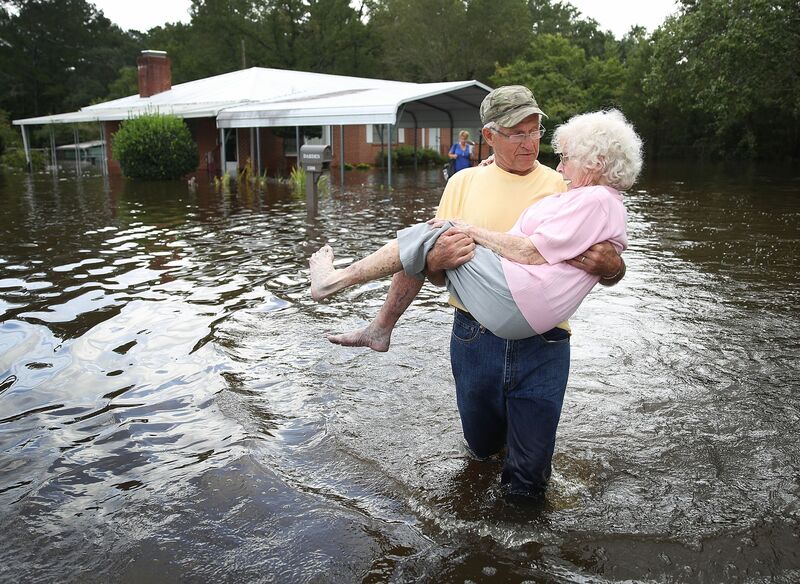 Bob Richling carries Iris Darden yesterday as water from the Little River starts to seep into her home in Spring Lake, N.C.
Below, behold Conway, S.C. Florence's death toll is least 32, including 25 in North Carolina, with the others in South Carolina and Virginia. Twitter is making it easier for users to see a full time-ordered list of messages from users they follow — the way the service worked at the start for everyone — writes Axios' Kia Kokalitcheva. The big picture: Several years ago, Twitter — seeking to make its service easier for new users and those accustomed to Facebook's heavily filtered Newsfeed — moved away from a simple timeline, adding "In case you missed it" and suggested tweets from accounts a user didn't already follow. 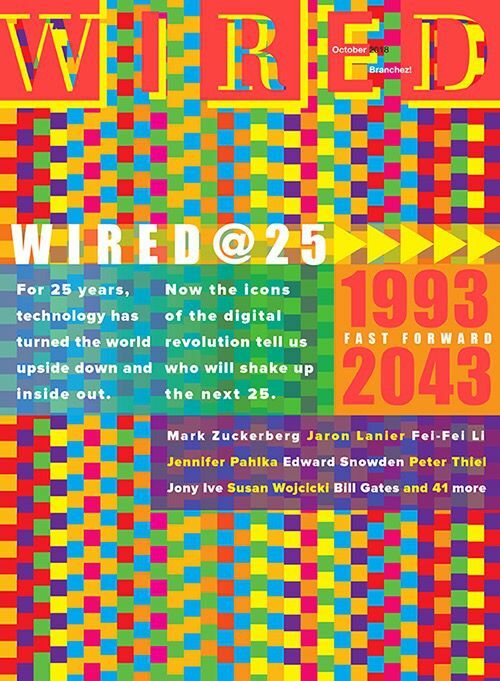 Who will care most: Twitter power users (including journalists! ), Twitter old-timers, and anyone who wants to use Twitter to monitor news events in real time. "At the end of the day, politics comes for you." That's a hard reality startups must face and embrace, Bradley Tusk, an ex-Mike Bloomberg campaign manager turned tech investor, tells Axios' Kia Kokalitcheva. 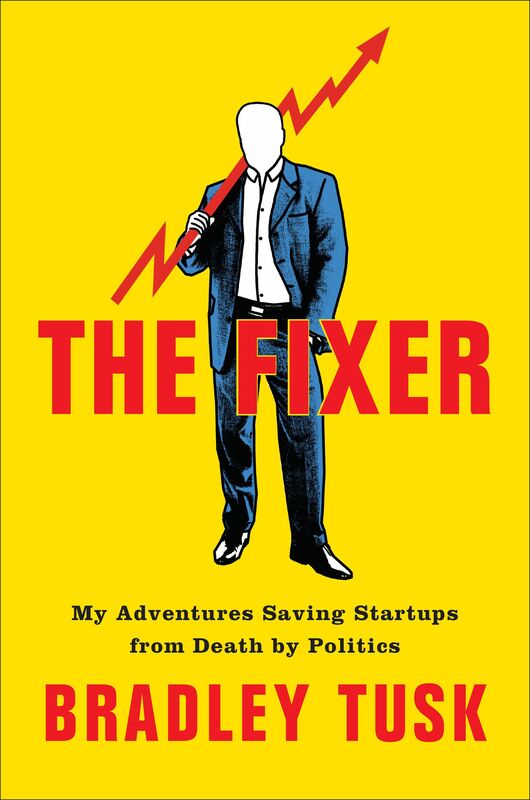 Why it matters: Tusk has parlayed his career’s lessons into a new book, "The Fixer: My Adventures Saving Startups from Death by Politics," which he hopes can help startups operating in highly regulated industries like transportation, sports betting, and cannabis. “You've got to take government and politics seriously because it can make or break your business,” says Tusk. After years in politics, he decided to open a consultancy to help businesses launch political-style campaigns on public issues. 8. 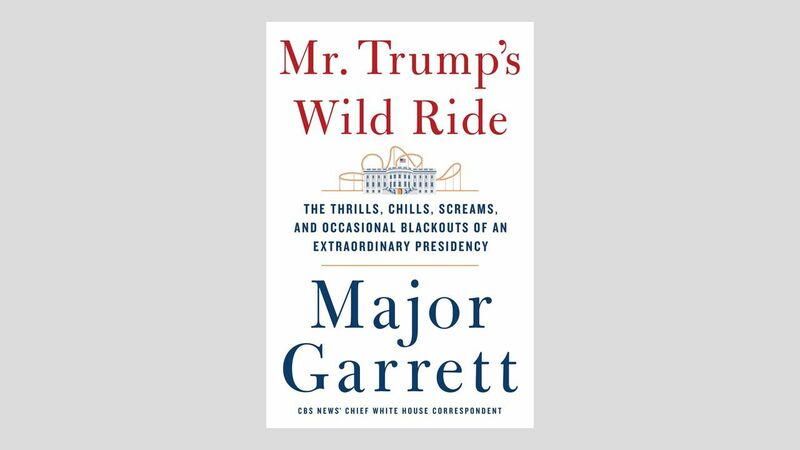 "Mr. Trump's Wild Ride"
"Leo thought 10 names were plenty for any candidate list. Because it had never been done before, there were no expectations. Ten would more than suffice." "But Trump, as is typical, was fixated. He often gets fixated and rare is the instance when he can be talked out of that fixation. In this case, he was fixated on the number 12." "Finally, Leo came up with an 11th name. He called [White House counsel Don] McGahn." Leo: "I’ve got good news and bad news. The good news is we have the list done. The bad news is it’s 11, it’s not 12." McGahn: "You’re kidding me. He’s not going to like that." 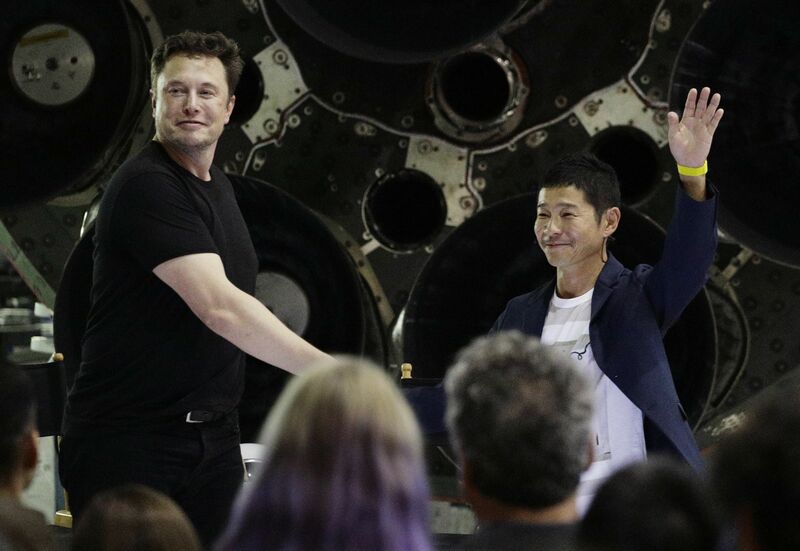 Yusaku Maezawa, 42, a Japanese billionaire, was announced by SpaceX CEO Elon Musk as the first-ever passenger for a commercial rocket trip around the moon, AP's Christopher Weber reports. Maezawa said he plans to invite six to eight artists, architects, designers and other creative people to join him for the weeklong journey, "to inspire the dreamer in all of us." "The Big Falcon Rocket is scheduled to make the trip in 2023," Musk announced at SpaceX headquarters near L.A.
"Musk said the entrepreneur, founder of Japan's largest retail website [online fashion mall Zozotown] and one the country's richest people, will pay 'a lot of money' for the trip, but declined to disclose the exact amount." "Maezawa came to SpaceX with the idea for the group flight, Musk said." 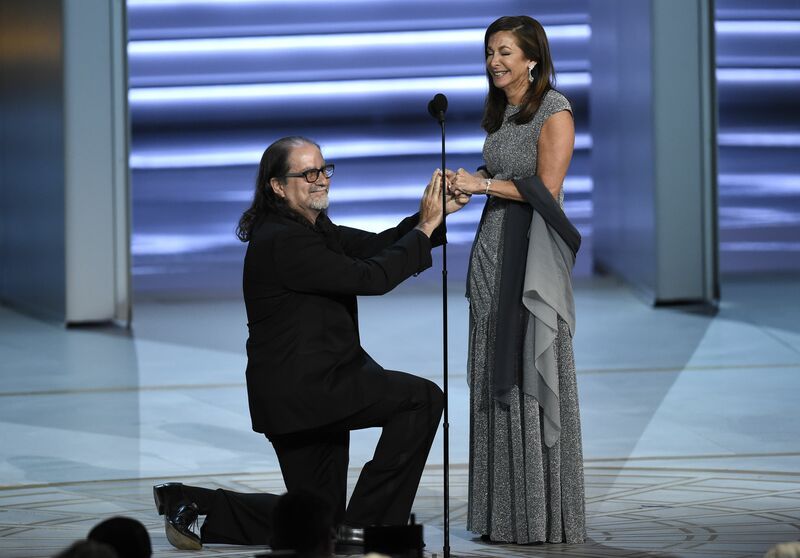 "HBO’s 'Game of Thrones' and Amazon Prime Video’s 'The Marvelous Mrs. Maisel' captured the top honors in drama and comedy at the 70th Primetime Emmy Awards" at the Microsoft Theater in downtown L.A.
Why it matters: "[A] tie between HBO and Netflix for most wins demonstrated just how splintered — and wide open — the television landscape has become in the era of streaming services." "When the Emmy nominations were announced in July, Netflix seemed the big winner, dethroning HBO, television’s long-reigning tastemaker, with 112 nominations compared to 108." "But redemption for HBO came ... [W]ith wins for 'Game of Thrones,' 'Westworld' and 'Barry' among others, HBO came away with 23 Emmys, as did Netflix, which picked up trophies in acting categories for 'Godless' and British monarchy drama 'The Crown.'" "NBC came in third with 16 ... FX Networks landed 12 Emmys on the strength of the Russian espionage drama 'The Americans.'"